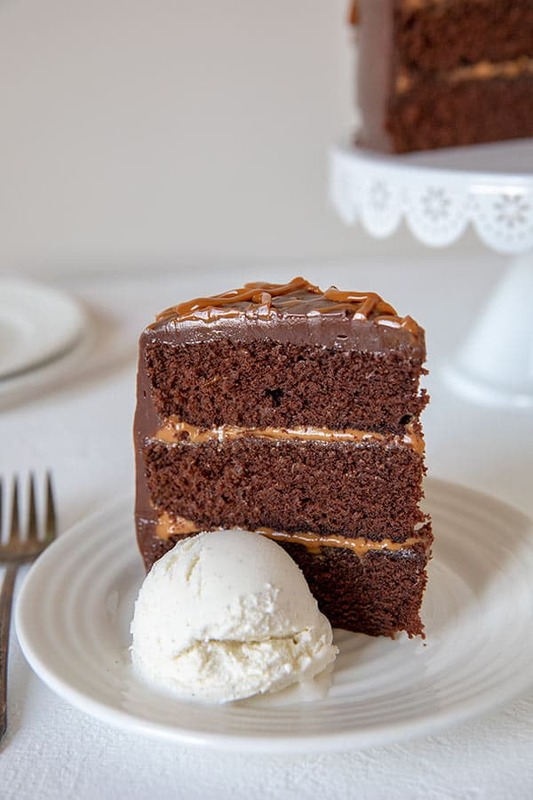 This rich, delicious, and easy-to-make Chocolate Dulce De Leche Triple Layer Cake is perfect any night of the week or for a special occasion. 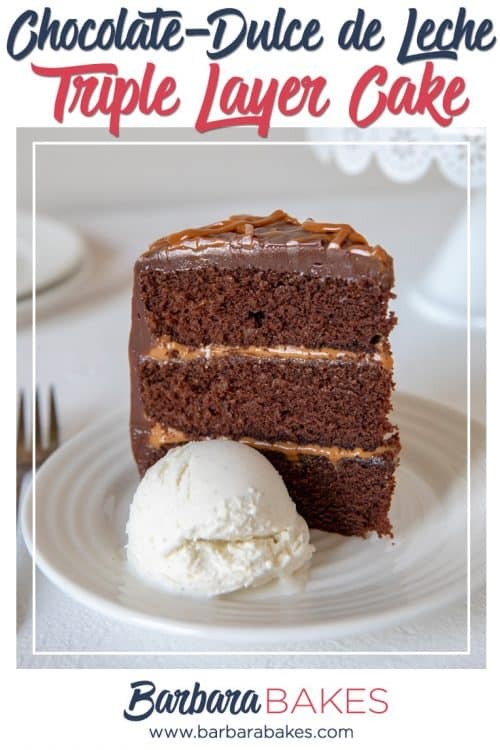 In my Italy and Greek Isles Cruise post I talked about recreating the Chocolate Dulce De Leche Triple Layer Cake I had for dessert several nights on the cruise. The menus changed every day on the cruise, but there were a few popular items, like this cake, that was on the menu every day. Chocolate and caramel are a classic combination. Dulce de leche is sweetened condensed milk that is cooked until it turns a golden color and has a luscious caramel flavor. 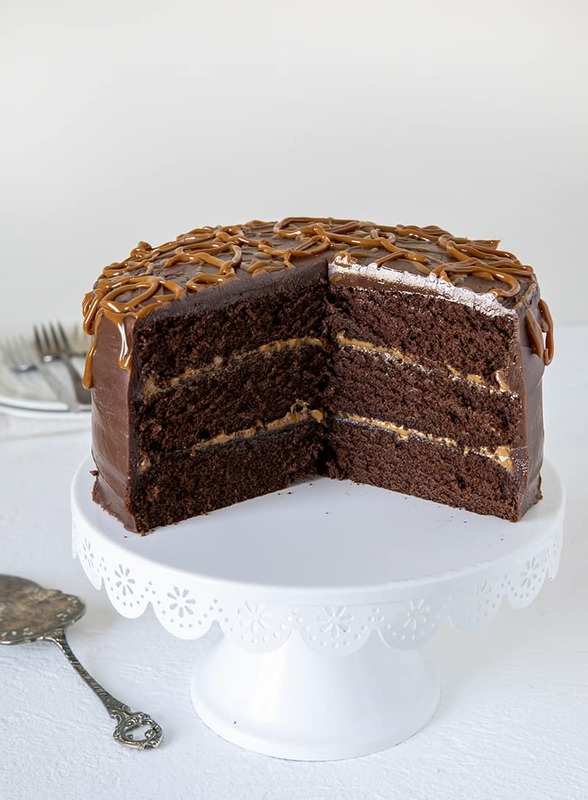 In this cake, dulce de leche is sandwiched between layers of not-too-dark chocolate cake and iced with a decadent chocolate ganache. It’s an irresistible cake that you’ll want to make again and again! 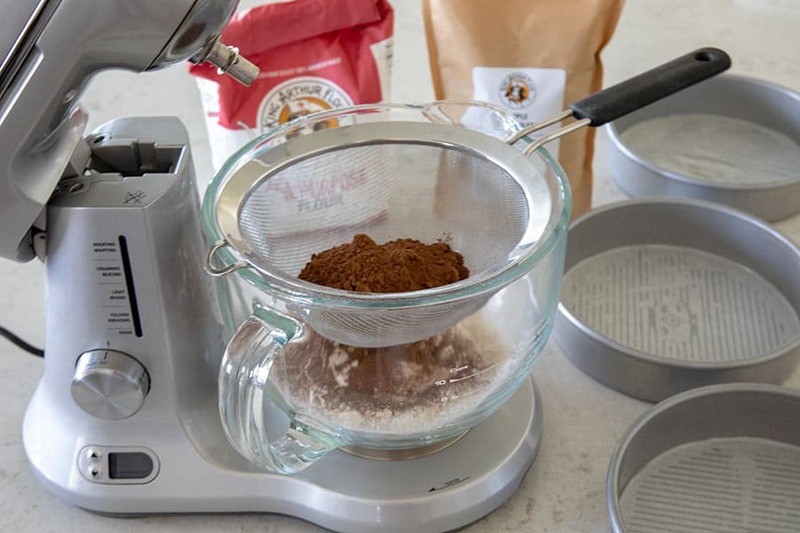 Whenever you’re using cocoa powder in a recipe, it’s important to sift the cocoa powder. There are generally always little lumps of cocoa powder that are difficult to incorporate into your batter if you don’t sift it to remove the lumps before adding to your other ingredients. King Arthur Flour makes my favorite cocoa. Its Triple Blend Cocoa is a mix of natural, Dutch, and black cocoas, so it’s perfect for every recipe. The cake uses a unique mixing method. Instead of creaming the butter and sugar, you blend the very soft butter and oil with the dry ingredients. Then you add the liquid ingredients to the sand-like dry ingredients. It’s important when you’re making a layer cake to divide the batter evenly between the pans. You can just eyeball it, but I like to use a digital scale. They’re fairly inexpensive to buy and make it easy to get perfectly even layers. When I’m baking layer cakes, I like to line the bottom of my pans with parchment paper. I buy flat sheets at Gygi, but they’re available at King Arthur Flour and on Amazon. King Arthur Flour has a fun post on uses for parchment paper. Check out my Baking Tips for Layer Cakes post for more great tips on baking layer cakes. Once your cakes are cooled, you’ll want to make the filling. The filling is super easy to make and starts with a can of dulce de leche. If you prefer, you could also make your own dulce de leche. Just be sure and cook it long enough so it’s thick and creamy and spreadable. The longer you cook it, the thicker it gets. All you do to make the filling is whisk the dulce de leche with a little bit of heavy cream. The recipe for the filling only uses 1 cup, so there’s a little left in the can to drizzle over the top of the cake. 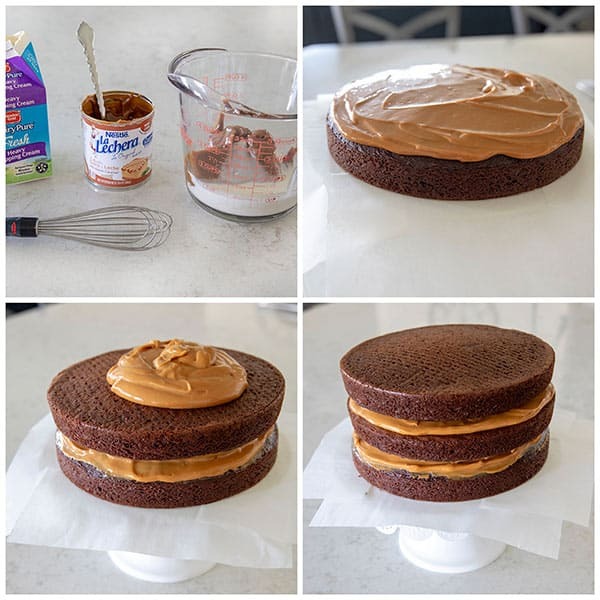 To drizzle the leftover dulce de leche on top of the cake, put it in a Ziploc bag and snip off a corner of the bag. I found it doesn’t drip down the sides easily, so I recommend just decorating the top of the cake. Chocolate ganache is my favorite way to ice a cake. It’s super easy to make and rich, creamy and delicious. The only trick with making ganache is you have to be patient and wait for it to thicken up before you spread it on your cake. 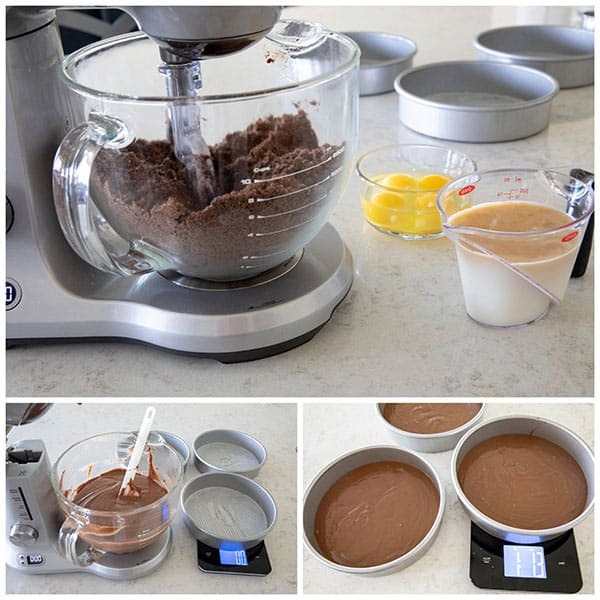 It can take an hour for the ganache to get to a thick spreadable consistency. You can put the ganache in the refrigerator and it will set up faster, but you have to stir it about every 10 minutes. I change up the original King Arthur flour directions a little bit to suit the way I like to bake. I also used King Arthur Flour’s High Altitude Baking Tips to make a few changes to the cake. The change are listed in the note at the end of the recipe. This cake was definitely a hit at my house. I loved it even more than the cake I had on the ship. I hope you’ll give it a try. Preheat the oven to 350°F. Lightly grease and flour three 8" round pans. You can also line the pans with parchment paper rounds. Measure the flour, baking powder, baking soda, salt, and sugar into a large mixing bowl. Place a strainer over the mixing bowl. 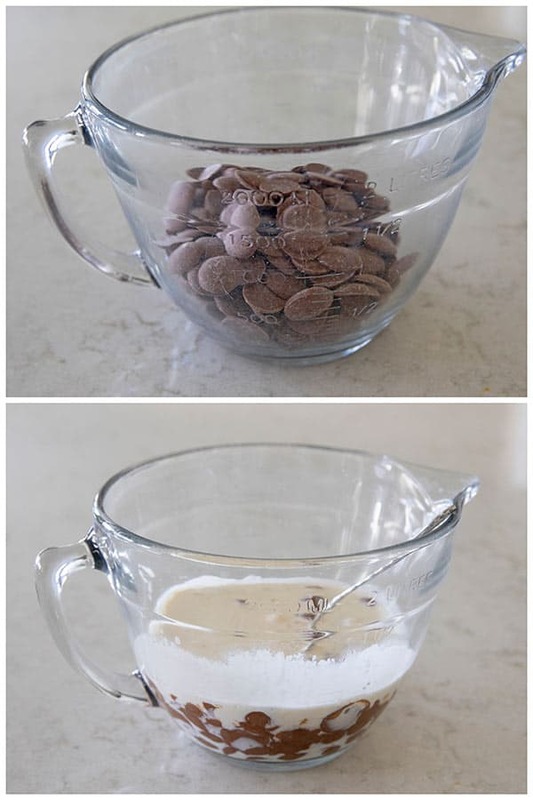 Sift/shake the cocoa through the strainer into the mixing bowl, to eliminate any lumps. Stir to combine. Add the butter and mix at low speed for 1 minute. With the mixer running, add the oil and continue mixing until the mixture looks like sand, about 1 minute. Scrape the sides and bottom of the mixing bowl, and mix for 1 minute more. Transfer the batter to the prepared pans, dividing the batter equally among the pans. Smooth out the tops of the layers with a spatula. Bake for 20 to 25 minutes. The cake is done when the top springs back when very lightly touched in the center, and the edges just begin to pull away from the edge of the pan. A toothpick inserted in the center will come out clean. Dulce de Leche Filling To make the filling, in a bowl, whisk together the dulce de leche and cream until smooth. Chocolate Ganache Place chocolate in a glass bowl. Heat heavy cream on medium high heat just until it comes to a boil. Remove from heat and immediately pour cream over chocolate. Wait two minutes and then stir until chocolate is completely melted and smooth (if necessary, you can microwave on 50% briefly). Cool until ganache is thickened but still spreadable. 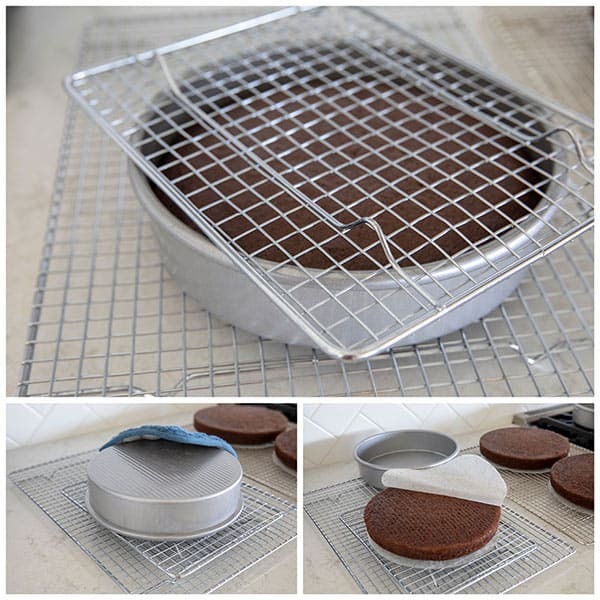 Place one cake layer onto a cake stand or serving plate. Spread half the dulce de leche filling in an even layer on the first layer. Top with the second cake layer. Spread remaining dulce de leche filling in an even layer on the second layer. Top with the third cake layer and spread ganache on the top and sides of the cake. Decorate top with remaining dulce de leche if desired. Note: * I made the following changes for my altitude - 5,000 feet. Added an additional 2 tablespoons flour, reduced the sugar to 1 2/3 cup, and added an additional 2 tablespoons of water. I increased the oven temperature to 365°F and reduced my cook time to 20 minutes. Can I use semi-sweet chocolate on the ganache instead of the milk chocolate? Thanks! Hi Jean – yes, if you prefer semi-sweet. 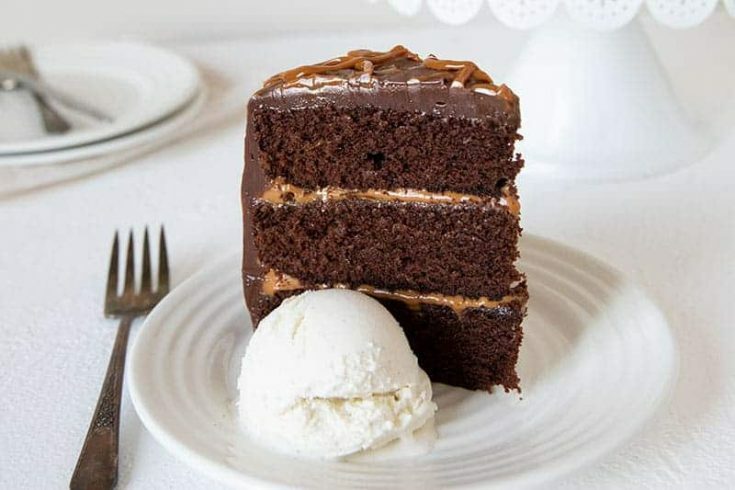 Question – the picture looks like there is Dulce de Leche in between the layers, but the instructions only say to spread they ganache between the layers. Is it both? Or just the Dulce de Leche? Thanks for the heads ups Bobbie – Just the dulce de leche is spread between the layers. I have updated the recipe.